Back to BALLIN - so this burger will blow your taste buds away and take no prisoners. Its frikin’ incredible and will be magic in your mouth. It has several layers, and I would say you can cut out any of them to cut down on time and still get an exquisite experience, but they definitely all work together reallllly well. 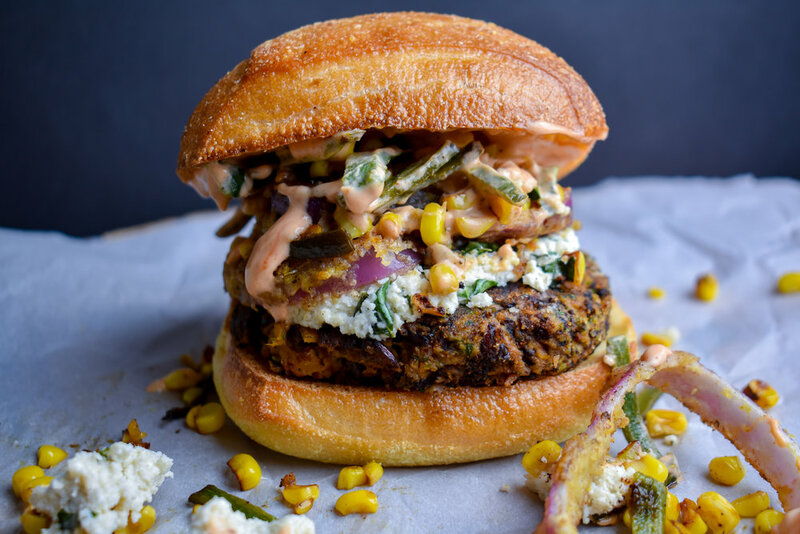 Sweet Potato Black Rice Burger - I wanted to make a hearty burger that had really nice creamy texture but also was not mushy. The black rice and crushed nuts give this patty a lot of body, but it also has incredible taste and is healthy as F for you! Herbed Goat Cheese - Vegan goat cheese?! Say what. We use a blend of cashews + macademia nuts with delicious fresh basil + oregano to make a tangy cheese spread that won’t leave you missing dairy. 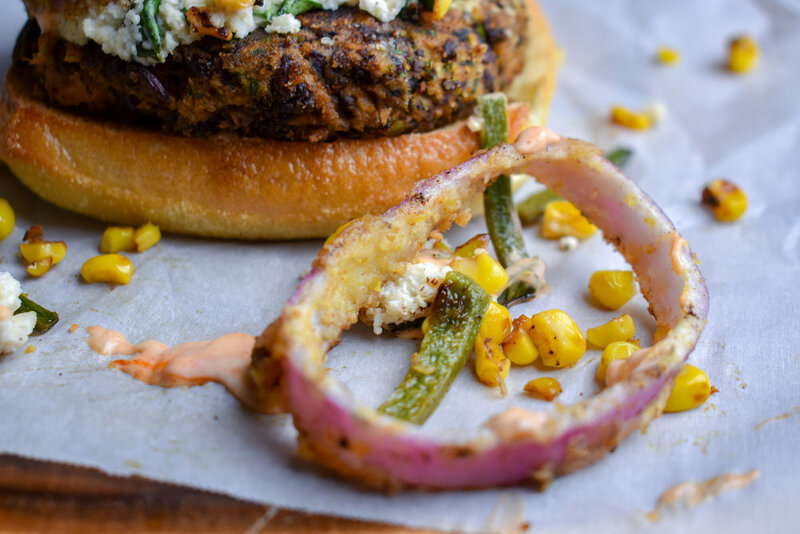 Poblano Corn Hash - We fry up poblano + corn with some lime juice + spices to add a great texture to the burger. Buttermilk Fried Red Onions - We cut the sharpness of the red onion by soaking them in buttermilk (vegan) and then batter/fry. 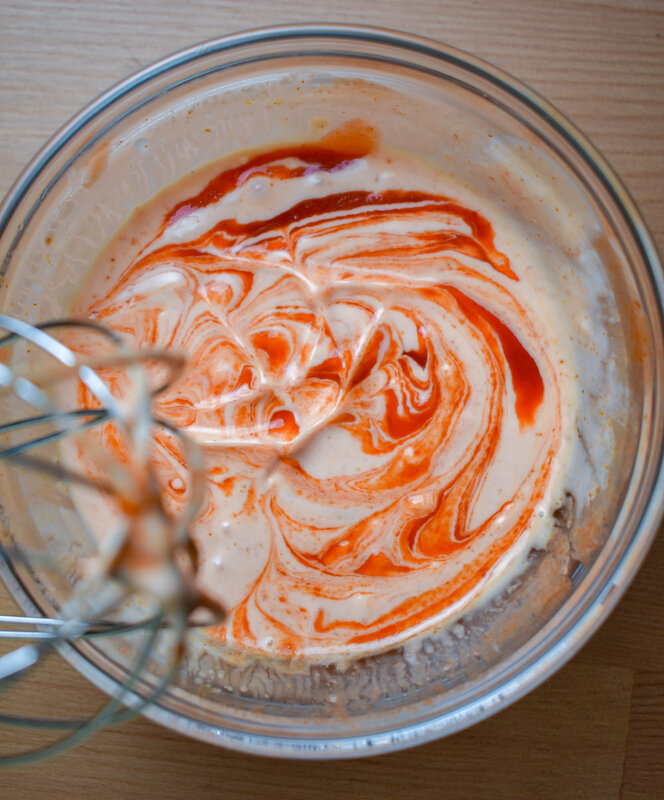 Sriracha Lemon Aioli - Yeah its as delicious as it sounds and it cuts through this tang with a nice heat! How’s that sound - yep, I agree - AMAZING! This burger is pretty simple but its a bit time intensive so if you’re looking for something easier I recommend leaving out the Hash or Onions! Bring medium pot of water to a boil, add cashews + macadamia, boil for 15 minutes. Drain. Bring rice + vegetable broth to boil in small pot. Reduce heat to low. Cover and cook for 30 minutes. 1. Put cashews, macadamia, and rest of goat cheese ingredients into a food processor sans extra 2 tbl of water. Process for 15-20 seconds. Scrape down sides and repeat while pouting in 2 tbl of water. Empty. Set aside. 2. Next, in a small bowl mix together the lemon aioli. Set aside in fridge. 3. After the rice is done cooking, add the pecans to food processor for burger patty. Pulse 8-10 times. Add rest of ingredients for burger and process until well mixed. Form into 4-5 patties. I did 4 large ones. Set aside. 4. Next, add 2 tbl of vegan butter or oil to a large pan and heat over medium-high heat for 90 seconds. Remove the onions from the buttermilk. Dredge in the cornstarch and then dunk back into milk then into a plate with the flour + salt. Add to pan and cook until crispy on each side (3 minutes on each side about). 5. To finish, after the onions, add more 2 tbl oil/butter to the pan. Reduce heat to medium and add patties. Cook 3—4 minutes on each side until browned. To form. 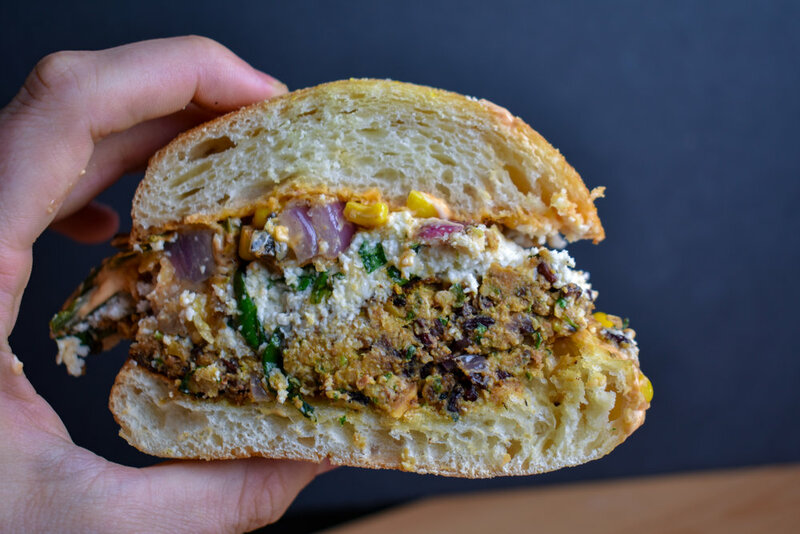 Add patty, 1/4 the goat cheese, red onions, the corn poblano hash, and then a nice layer of the aioli to a bun.